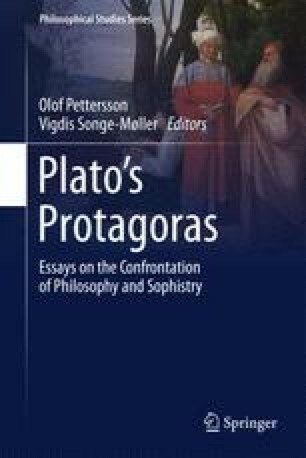 Plato’s Protagoras plays off the genre of Greek comedy in its expression of its philosophical meaning. This dialogue at points invites us to re-envision Socrates against the backdrop of Aristophanes’ criticisms of Socrates and the sophists. The Protagoras follows some of the conventions of Greek comedy but interrupts its form with moments of lengthier rational discussion absent in Greek comedy. The dialogue’s logos and antilogos lead to aporia, but this aporia shows a limit to reason that recognizes human incompleteness without leading to misology. In contrast to performed drama, the written form of the dialogue both engages its audience’s emotions while allowing the reader to return to the text and to continue their rational assessment of the arguments. Burgess, Watson S. 2014. Living Poets. Durham. https://livingpoets.dur.ac.uk/w/Euripides,_Iphigenia_at_Aulis_1211-1215. Accessed 2 Apr 2014.